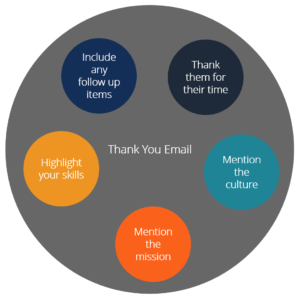 Why Send a Thank You After Interview Email? While it’s not “required,” it’s highly recommended to send a thank you after interview email to reinforce your interest in the opportunity, highlight your strengthsPersonal BrandOur personal brand is what people see in us. It reveals who we are, what we offer, and what we value. When we work in a company, our colleagues create a perception about us based on how we present ourselves to them. This can either be good or bad, depending on how, and follow up on anything from the interviewInterview Tips – How to Interview WellHow to interview well. This guide gives you a list of the top 10 interview tips, based on decades of firsthand experience from the CFI team interviewing hundreds of candidates. interviews can always be nerve-racking. Luckily, being well prepared is a great way to reduce stress on the big day.and interview well. It’s recommended to send the email within a few hours of the interview, as hiring managers often make their decisions very quickly and you want to keep their impression of you as high as possible. Ask for a business card or contact information from every person who interviews you and send a “thank you” email to each one of them. Customize the email for each person, as they may forward the emails to each other, and you want to make sure you don’t get caught just sending boilerplate emails where the only difference is the name of the recipient. Highlight what you like about the job opportunity. Highlight what you like about the company. Recap your main skills and attributes. Follow up on anything that you said that you’d get back to them on. You can copy and paste the message below to create your own message. Be sure to edit, customize, and proofread your message before sending it. 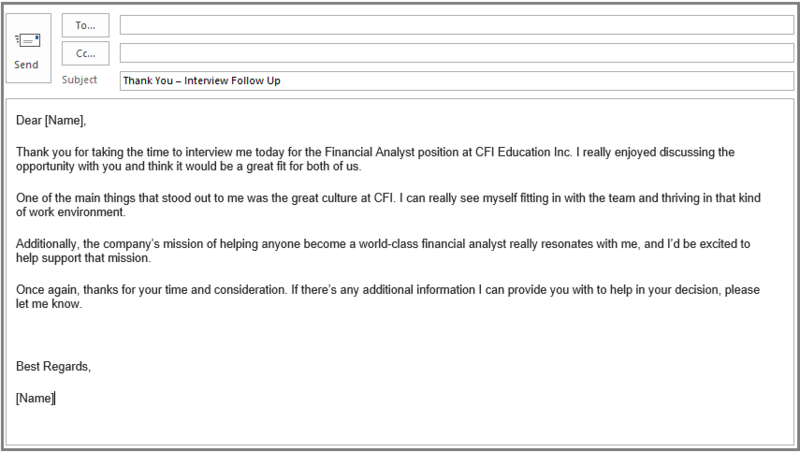 Thank you for taking the time to interview me today for the Financial Analyst position at CFI Education Inc. I really enjoyed discussing the opportunity with you and think it would be a great fit for both of us. One of the main things that stood out to me was the great culture at CFI. I can easily see myself fitting in with the team and thriving in that kind of work environment. Additionally, the company’s missionMission StatementA mission statement defines what line of business a company is in, and why it exists or what purpose it serves. Every company should have a precise statemen of helping anyone become a world-class financial analyst really resonates with me, and I’d be excited to help support that mission. Once again, thanks for your time and consideration. If there’s any additional information I can provide you with to help in your decision, please let me know. You can, of course, use the above template/example for your thank you after interview email, or you can write one from scratch. If you plan to write one from scratch, this section will serve as a helpful guide. Confirm the name, title, and email address of the person. Write an opening sentence thanking them for their time and saying that you enjoyed meeting them. Refer to any notes you took in the interview about you things you really liked. Go to the company’s website and review their mission, vision, values, and/or purpose in their “about us” section. Then you can note in your email a couple of things you particularly like about their culture and mission. Write a closing sentence thanking them again and offering to answer any follow-up questions they may have. 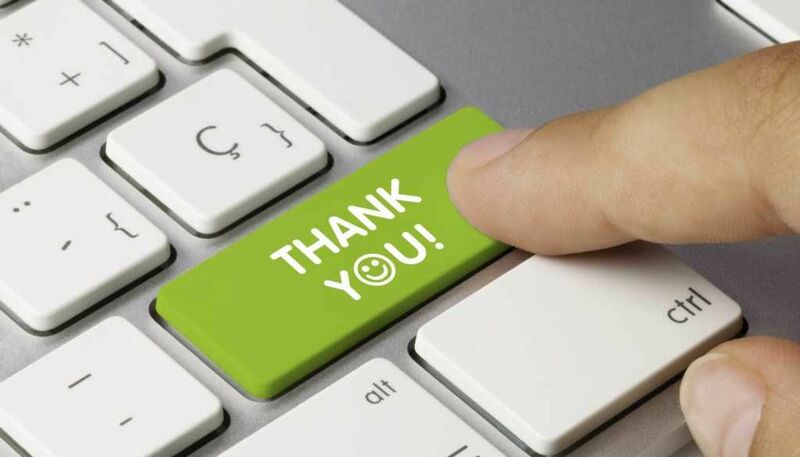 There are instances where it may be appropriate to include additional items in your thank you after interview email. Taking this extra step to be more engaging with the interviewer can go a long way toward successfully making yourself stand out from the crowd of applicants in a positive way. Hyperlinks to things that were discussed in the interview (e.g., articles, news, etc.). Attachments, such as work you’ve completed in the past (e.g., Excel files you created or PowerPoint presentations you built. Note: Be sure you are not sharing confidential information). References, if you were asked to provide them. Send the email within a few hours of the interview. Be polite and professional in your language. Highlight things you liked about the job, company, culture, and mission statementMission StatementA mission statement defines what line of business a company is in, and why it exists or what purpose it serves. Every company should have a precise statemen. (You can use this opportunity to elicit a reply to your email by turning things around by writing, “I’d be interested to hear what you think are the company’s core values”. Mention your skills and strengths that best match the job opportunity and what you learned from the interview about what the company is most looking for from the person who is ultimately chosen to fill the position. Don’t appear overconfident by sounding as if you just assume that you got the job. Offer to answer any additional or follow-up questions the interviewer may have.